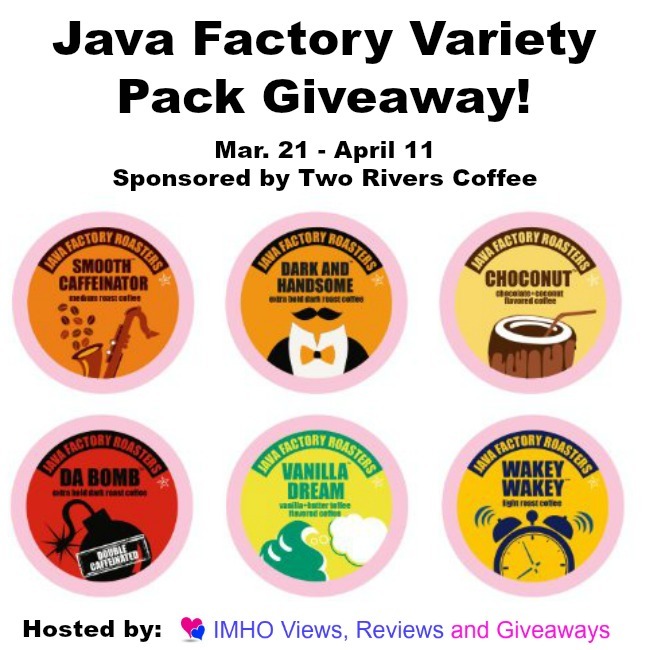 Can’t wait to see if you won, you can purchase the Java Factory Variety Pack here. If you visit our Facebook pages and enjoy them, please “like” them of your own free will. The fact is that the more followers we have, the more sponsors contact us for giveaways. Thanks in advance for “liking” us! It truly does help us bring you better giveaways! Please enter the giveaway through the Giveaway Tool listed below. Giveaway Tool will randomly select a winner. Winning entry will be verified. All entries are optional, and the chance of winning depends on the number of entries. No purchase necessary, void where prohibited. By entering this giveaway you are agreeing to have your name listed as the winner on the giveaway widget and winner’s list of participating blogs. The winners name will be posted on the widget and also here. In the case of any malfunction of the Giveaway Tool the giveaway will be cancelled and no prize awarded. Winner is responsible for any applicable taxes. Vanilla dream sounds like it would be an interesting coffee to try out! Would LOVE to try Waky Waky…and all of the others…haha! I would love to try the Wakey Wakey flavor first.